Endosulfan has been used in agriculture around the world to control insect pests including whiteflies’, aphids, leafhoppers, Colorado potato beetles and cabbage worms. Due to its unique mode of action, it is useful in resistance management; however, as it is not specific, it can negatively impact populations of beneficial insects. It is, however, considered to be moderately toxic to honey bees, and it is less toxic to bees than organophosphate insecticides. In its response to a petition filed by the Democratic Youth Federation of India, the central government has told the apex court that endosulfan is unlikely to cause any public concern or hazard and therefore, it is not the reason behind health problems in Kasaragod, Kerala. In this regard, the central government told that there is an overall weight of evidence from in-vitro and in-vivo screening tests that Endosulfan is not an endocrine disruptor. It is reported that Endosulfan is either carcinogenic or mutagenic. Endosulfan is a highly toxic chemical and poisonous to most living organisms. The United States Environmental Protection Agency classifies it as ‘highly hazardous. It has been responsible for hundreds of deaths worldwide, and significant short and long-term human health impacts. Endosulfan kills indiscriminately and is devastating to the environment, contaminating soils, air and water, and damaging mammals and other animals. Endosulfan’s ability for long-range environmental transport, together with its adverse effects supports the need for concerted international action. To date, 62 countries have already voluntarily banned the use of endosulfan. Because of its threats to human health and the environment, a global ban on the manufacture and use of endosulfan was negotiated under the Stockholm Convention in April 2011. The ban will take effect in mid-2012, with certain uses exempted for five additional years. Although classified as a yellow label (highly toxic) pesticide by the Central Insecticides Board, India is one of the largest producers and the largest consumer of endosulfan in the world. Of the total volume manufactured in India, three companies — Excel Crop Care, Hindustan Insecticides Ltd, and Coromandal Fertilizers — produce 4,500 tonnes annually for domestic use and another 4,000 tonnes for export. Endosulfan is widely used in most of the plantation crops in India. Toxicity of endosulfan and health issues due to its bioaccumulation came under media attention when health issues precipitated in the Kasargod District (of Kerala) was publicised. This inspired protests, and the pesticide was banned in Kerala as early as 2001 following a report by the National Institute of Occupational Health. In the Stockholm Convention on Persistent Organic Pollutants of 2011, when an international consensus arose for the global ban of the pesticide, ironically India stood against this move owing to pressure from the endosulfan manufacturing companies. This flared up the protest, and while India still maintained its stance, the global conference decided on a global ban, for which India asked a remission for 10 years. Later, on a petition filed in the Supreme Court of India, the production, storage, sale and use of the pesticide was temporarily banned on 13 May 2011, and later permanently by the end of 2011. 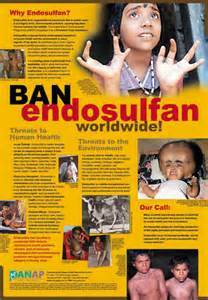 Endosulfan has killed, and will continue to kill and maim if it continues to be legal. National prohibitions on use, together with inclusion under the Stockholm Convention will ensure endosulfan’s eradication from global use and an opportunity to protect people and their shared environment from this deadly chemical.